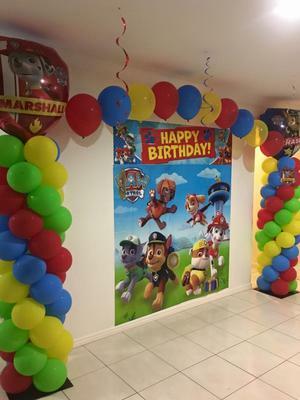 Hello, I want to make 4' Paw Patrol themed balloon columns for my children's birthday party. There are six main colors, each representing a different puppy (red, orange, pink, yellow, green and blue). I notice a lot of spiraling balloon columns only include four colors. How would I arrange the balloon colors to form a spiral style column? Or would I have to stack the colors in rows instead? To achieve a spiral pattern with 6 colors you would have to create the column with clusters of 6 balloons each. Best would be to use 5 inch balloons. 11" balloons would be too large for a 6 cluster column. However, creating clusters of 6 balloons is rather difficult. You'd make it easier for yourself if you stick to 5 colors, using clusters of 5 balloons. How to achieve the spiral pattern is explained on this page about balloon arches. How about using 5 colors for the column, and the 6th color for a big topper balloon? The topper balloon could be either latex or mylar. Alternatively, if you really want the 6 colors equally used in the column, you could stack the balloons as you mentioned yourself. But this would mean that you loose the nice spiral pattern. Would love to see a photo of your Paw Patrol columns. Sandi Masori uses 9 inch balloons in the video for the 5 color column, blown up to about 8.5 inches. You should need 9 or 10 pumps to get them to this size. what size balloons are you using and how many air pumps each balloon? Thanks very much for posting the pattern. That's very helpful. And hello as well to Colin from ballooncreations.com.au. Very nice column! We've added your website as source just below the image. There is a specific pattern to use in creating a 4 cluster column/arch with 6 different color balloons. It's best for an arch, unless you use smaller sized balloons. It's a little complicated but here is the pattern. That will complete the spiral and give you a nice rainbow pattern.